In this COMBO OFFER, you get instant access to our concluded programme PRABODHAN Mastercourse 2018-19 (180 sessions of 90 min on The Hindu editorials) + the Mastercourse for 2019-20, elaborated below. Features for 2019-20 are evolved and different from 2018-19, please note. This offer is valid only till 31-May-2019. 4. Total course is of 180 + 150 sessions in all. 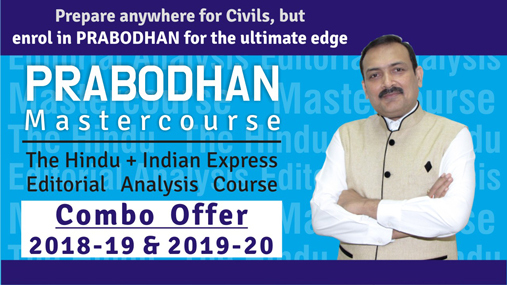 Special Combo Offer : Rs.17,900/- for 2018-19 (immediate access) + 2019-20 Mastercourses.